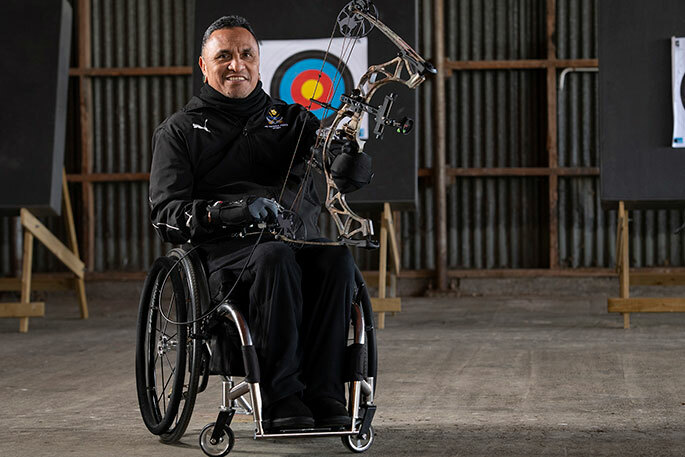 For NZDF Invictus Games team member George Nepata, being back in the military environment feels like being back among long-lost family. Suffering a terrible spinal injury that left him a tetraplegic aged just 22 has led Taupo man George Nepata to some pretty challenging times but, right now, “life is good”. That’s mainly thanks to his family, and also to being part of the New Zealand Defence Force (NZDF) Invictus Games team to compete in the Invictus Games Sydney 2018 this month. The Invictus Games are the only international adaptive sporting event for wounded, injured and ill active duty and former service members. This year’s event, from 20-27 October, will involve 500 competitors from 18 allied nations in 11 adaptive sports. George was injured in a training accident in Singapore in 1989, cutting short his New Zealand Army career. After his accident he relocated to his home town of Taupo, living there for 28 years before moving to Christchurch 18 months ago with his family. He heard about the Invictus Games through a couple of friends who are still serving and his brother, Damien Nepata, who was also injured while serving in the Army, and the two will compete together this year. “I’m grateful to have been given this opportunity to compete in the 2018 Invictus Games, especially alongside my brother. Age is creeping up on me, so this is both a physical and mental challenge that I haven’t had in a number of years, which I am taking it on with both hands,” says George. Mr Nepata’s wife, Kim, daughter Royal New Zealand Air Force Corporal Whakapono Nepata and 14-year-old son Ngaheke will also travel to Sydney to support him. Corporal Nepata says she felt “super privileged” to be going to the Games to see her father compete and to see him doing what he loves, which is playing sport. “During his time in the Defence Force he made some great friends and played several sports for the Army. I can tell it makes him happy to be back in that team environment, and also to have the opportunity to play alongside fellow soldiers again,” she says. George says the reality that as an active young man who loved the outdoors he would never walk again was hard to accept. It took him years to get used to it, and his family played a huge part in his recovery. “Kim was the one who encouraged me to take the opportunity to compete in the Invictus Games. She said it would benefit me both physically and mentally, and it would also give my kids and my granddaughter something to be proud of,” he says. “As a family we have faced many challenges. However, we’ve pushed through and we’ve moved on by staying positive, which led to us growing stronger as a family. The Invictus Games Sydney 2018 are presented by Jaguar Land Rover. The NZDF team is sponsored by Auckland RSA, Christchurch Memorial RSA, Fulton Hogan, Jaguar Land Rover and Direct Sport.